This procedure can also be applied also to different datum projections. Clarke 1880 in TM (Transverse Mercator) in feet is the standard projection on many sector maps of TCPD (see also Annex 8). 2. Input > Transverse Mercator > Output: UTM. 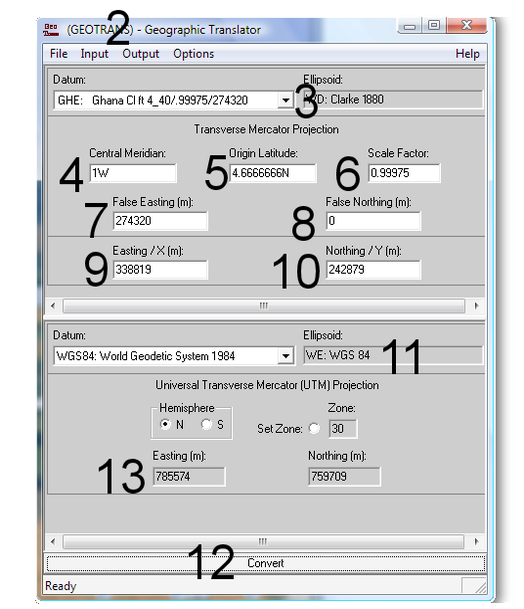 Take a pocket calculator and convert the feet to meter by dividing it by 3.28084 (as 1 ft = 0.30480 m) and enter the result in the Geographic Translator under Easting. (See also Annex 2.5for conversions). For example: If map reading shows: 1111610, divide by 3.28084, equals 338819. 10. Northing value: Repeat the same process (step 9 above) for northing. 12. Press the Convert button at the bottom. A more general description to convert between different projections (with an example to convert from lat / long to UTM) is given in Chapter 5.1.3.